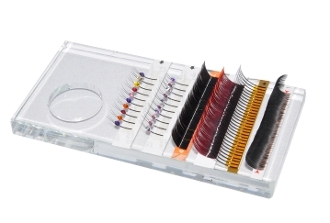 This lash tile holds and organizes your lashes for faster and easier lash application. The heavy glass material helps the tile to stay in place when you pick up the lashes. It allows you to more easily handle the eyelash strips and glue during the application. It organizes multiple sizes of eyelashes onto one tray.